We're making a new movie, The Yes Men are Revolting, that uses humor and disruptive action to focus on climate change, the corporate money that keeps us from addressing it, and the movement that can take our democracy back. It will also launch our most ambitious plan ever: a platform to turn every viewer's enthusiasm and energy into action around these these life-or-death issues and more. But to do all this we need you. We need you to support our crowdfunding campaign on Kickstarter, or just spread the word. When you pledge to this project, a whole host of unique rewards are yours—including a Secret Decoder Ring that's loaded with media and an access code to secret communications we'll be sending you soon. There are also some more practical rewards—like a Halliburton Survivaball, essential for surviving imminent climate catastrophe. By pledging, you will be making possible a very funny film about our action-packed mission to hold governments accountable despite overwhelming corporate influence. It's got hilarious exploits, shocking documentary footage, nasty stings on evildoers, and a personal story that's sure to keep viewers on the edge of their seats. But what's truly unique about this film is that it's going to help every viewer get active herself via a human-staffed platform we're calling the "Action Switchboard." This platform, which we're designing in cahoots with folks at Mozilla, taps our 100,000-activist database to create fun, meaningful, movement-building projects around the issues we all care about. On our Kickstarter page, you'll find one of the weirdest, funniest “direct action” videos you're likely to see. Check it out—and even if you're not in a position to kick in money, you can tweet or facebook the link. Please support and spread the word about The Yes Men Are Revolting and the Action Switchboard. Direct action is critical to democracy. Let's make more of it! To prevail, Shell lawyers must overturn a 200-year-old law, the Alien Tort Statute (ATS), that compensates victims of international crimes. (The lawhas been used to compensate Holocaust survivors who sued for restitution from corporations that profited from slavery and forced labor during World War II.) Shell's lawyers are arguing that their corporation is not subject to the ATS because it is not a person. Attention NYU students: TWO subversive pleasures are available for credit! 1. JOIN THE YES LAB, beginning October 13, and fight for a worthwhile cause while having more fun than you thought possible. It'll start with a full-day introductory workshop Oct. 13, during which you'll team up with local activist groups and the Yes Men to figure out just the right project for you. You and your group will then meet once a week throughout the semester for feedback. Visit the Hemispheric Institute website to sign up, and yeslab.org/projects to learn how people like you have used trickery, mischief, and giggles to promote a better, more interesting world. If you're interested in receiving NYU credit for Yes Lab participation, email nyu@yeslab.org. 2. ATTEND CREATIVE ACTIVISM THURSDAYS beginning October 11, and continuing all year. It's a series of lectures, workshops, and other events focusing on the potential for societal change, and what we can do to bring it about through creative tactics and strategies. Visit the Hemispheric Institute website for our amazing fall 2012 lineup. And if you're interested in receiving NYU credit, email nyu@yeslab.org for more info. Creative Activism Thursdays is co-sponsored by NYU Dean for Social Science, the Hemispheric Institute, the Yes Lab, the Humanities Initiative at NYU Working Research Group on Artistic Activism, CAA, and Not an Alternative. Speakers often attend following Yes Lab Friday. In New York? Join the Yes Lab this fall! If you're with a New York-based activist organization and want to carry out an action around your campaign goals with advice from the Yes Men and the help of awesome NYU student interns—and learn the Yes Men's publicizing, brainstorming, and project-management techniques in the process—just visit www.yeslab.org/orgs and follow the links to apply! Greenpeace, the Yes Lab, and members of the Occupy movement are claiming responsibility for a set of actions that have focused intense attention on Shell's Arctic drilling program. "This experience shows that a few energized people can compete with the billions that Shell spends on advertising and lobbying," said James Turner from Greenpeace, who posed as an advertising executive at the event. "As people find out how this oil company is exploiting global warming to cause yet more global warming, thus endangering everyone, they won't allow it, no matter how many billions Shell has in its war chest." The centerpiece of the action was a lavish party in the Space Needle, in which a model of an Arctic-bound oil rig "accidentally" spewed liquid in the face of the rig designer's "widow"—actually 84-year-old Occupy activist Dorli Rainey, well known for having been brutally pepper-sprayed in the face by Seattle Police during Occupy protests last fall. A one-minute video of that "malfunction," shot by Occupy "infiltrator" Logan Price, quickly reached the top spot on Reddit and the #2 spot on Youtube, with a half-million views in less than 24 hours. "We know that climate change is putting the entire planet at risk," said Rainey. "It's our duty to stop companies like Shell from using fossil fuels as a lethal weapon—even if it means being sprayed again and again in the face." 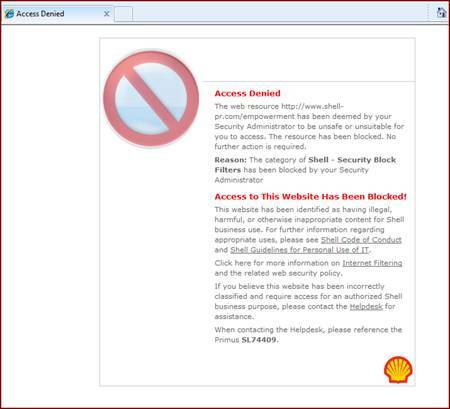 As Shell denied, with disappointing blandness, having had anything to do with the party or the "malfunction," the Yes Lab sent out a press release on Shell's behalf, threatening anyone who reposted the video and attacking also the activists' brand-new ArcticReady.com website, which includes a social media ad generator and a dangerously addictive children's video game called Angry Bergs. The fake Shell release generated additional media coverage. Earlier this year, Shell obtained a legal injunction stopping any Greenpeace activist from coming within 1km of any Shell vessel. To thank the company, Greenpeace teamed up with the Yes Lab to plan a promotional advertising campaign for Shell's Arctic drilling efforts, which Shell prefers to keep quiet. Besides the ill-fated ceremony and the website, the campaign includes a number of other elements that will shadow Shell's summer Arctic destruction campaign. The device which sprayed Rainey's face was a model of Shell's drill rig, the Kulluk, which is set to soon depart Seattle for the Arctic. The Kulluk was built in 1983 by Mitsui, the same company that, two decades later, built the ill-fated Deepwater Horizon. Earlier this year, Mitsui paid out $90 million to the U.S. for its role in the Deepwater Horizon disaster. "What Shell is preparing to do in the Arctic is the height of obscenity," said Andy Bichlbaum of the Yes Lab. "We've got to do everything we possibly can to draw attention to this unfolding disaster, and more importantly we've got to stop it." "The melting Arctic is becoming a defining environmental issue of our era, and this campaign is just a taste of what's to come," said Turner. Do you know any New York organizations that would like to ruin more nasty parties, or otherwise make a splash around a campaign issue? Read on! And let's have our own party in Times Square TOMORROW (Tuesday, May 15th, at 6PM) to make it clear that another city (and another world, of course) is possible. More information: anothernyc.org, @anothernyc, facebook.com/anothernyc. By mary@yeslab.org on May 14 2012 - 11:51am Tagged: TPP, globalization, award, party Project: Trans-Pacific Partnership Receives "Corporate Power Tool Award"